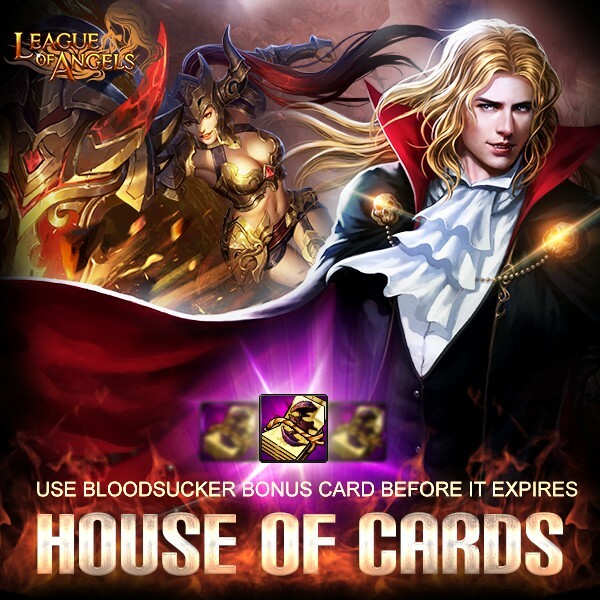 A little tip: The Bloodsucker Bonus Card will expire when Febuary ends, which means this is the last chance you can use it to swap for the powerful Bloodsucker in House of Cards! Don't miss it out! This time, you can recruit Inflamed Guard to your party. Don't miss the chance! Take Lannister who has Divine DMG with you to add more stats to your heroes! More powerful heroes and useful gems are waiting for you in game! Resources: Lvl. 11 MATK+CRIT Damage Gem, Lvl. 11 PATK+CRIT Damage Gem, Khaos Core, Purgatory Soul, Purifying Soul, Lvl.5 Aeolus Glorystone, Lvl. 5 Brooky Glorystone, Lvl. 5 Flaming Glorystone, Lvl. 5 Shadow Glorystone, Lvl.11 Patk+Dodge, Lvl.10 Agility+Hit, Lvl.8 Dodge+Hit Gem, Lvl.8 Dodge+Block Gem, Ruby Herosoul, Spring of Wisdom, Blessed Stone, Elemental Scroll, Magic Socketing Rod and many more! Description: Consume certain amount to get extra rewards like King of Spades, Ace of Spades, Hero's Mark, and Joker (S). More exciting events are coming up through Feb 18 to Feb 21 (Server Time), check them out in the in-game Hot Events menu now! LoA_Enjoy the Carnival and Write Down Your Love Story in LoA!